Amid slowing global growth, weaker external demand, and rising protectionism, the near-term prospects for the ASEAN+3 region is expected to be softer, while the longer term economic fundamentals remain intact. Regional policymakers need to stand ready to mitigate the downside risks by using the available policy tools flexibly. 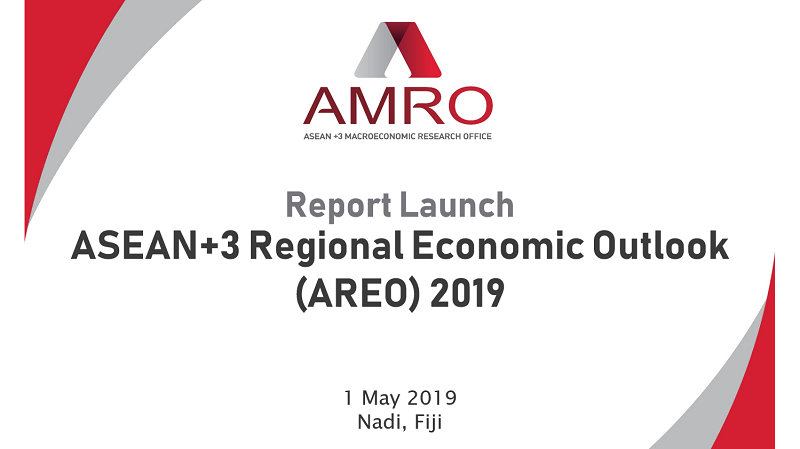 The contents of the AREO report will be discussed by AMRO Chief Economist Dr Hoe Ee Khor at the AREO 2019 launch on May 1, 2019 in Nadi, Fiji. The event is open to the media and interested participants. Please go to the registration page to register for the event. Dr. Khor is the Chief Economist of AMRO responsible for overseeing and developing the work on macroeconomic and financial market surveillance on East Asia and on the member economies in the region. He is also a member of the senior management team responsible for setting the strategic direction and management of AMRO. Prior to joining AMRO, Dr. Khor was a Deputy Director of the Asia and Pacific Department (APD) at the International Monetary Fund (IMF), responsible for overseeing the surveillance work on six ASEAN and twelve Pacific Island countries. Dr. Khor started his career as an economist at the IMF in 1981 and had worked on a wide range of economies in the Western Hemisphere and Asia and Pacific departments. He was the IMF Deputy Resident Representative in China from 1991-1993. From 2009-2010, Dr. Khor was Head of Economic Development and Chief Economist at the Abu Dhabi Council for Economic Development (ADCED). Dr. Khor joined the Monetary Authority of Singapore (MAS) in July 1996 and was Assistant Managing Director from 2001 to 2009 where he was responsible for economic research, monetary policy, macro-financial surveillance, and international relations. Dr. Khor obtained his Bachelor’s Degree in Economics/ Mathematics from the University of Rochester and a Ph.D. in Economics from Princeton University.